Spring is officially in bloom. We’ve entered that season of cleansing and renewal — when we get our rooms and lives in order, when we stow away the reminders of the winter, and when we finally trash the specters of last year’s stunted relationships and replace them with hope for new romances. As the warm weather prompts us to shed the layers and show more skin, it’s worth it to consider the items in your wardrobe and ask: would I wear that on a date? I’ve come up with a few “go-to” articles of springtime clothing that are as great for daytime dates as they are for more “serious” evening outings. 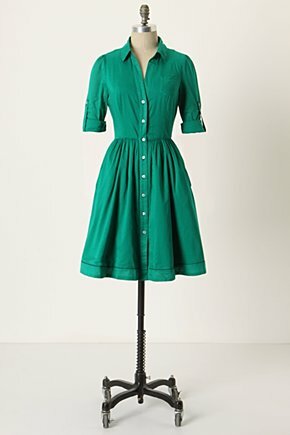 My pick for a "starter" shirtwaist dress. The "Reed Shirtdress" available at Anthropolgie.com, $118.00. A Shirtwaist dress — Eternally classy, easily transitional, subtly masculine, always feminine, the shirtwaist dress has been a staple of the well-put-together woman’s wardrobe since the 1930s. Sundresses are best for the days after Memorial Day, and the wrong print can make you look like a teeny-bopper, while a shirtwaist dress screams sophistication a la Audry Hepburn. A solid color or a pinstripe is the most classic and the most versatile, though if you’re brave enough, opt for a print. A wide leather belt, boots, espadrilles, some chunky statement jewelry, whatever your heart desires is all you need to make this classic silhouette venue appropriate, or less Upper East Side and all your own. A peasant/hippie blouse — La vie de boheme is never passe, and boho chic has never been chicer thanks to the “cool to be Green” movement. A fine cotton, embroidered peasant blouse easily pairs with a denim jacket. Wear it with those boyfriends jeans and some sandals if you want to invoke the carefree “love not war” attitude of the cast member of “Hair” for a Sunday in the Park. If you want something urban rather than earthy, you still have your skinny indigo jeans and killer ankle boots from winter to turn to. Come summer time, tie on your espadrilles, zip up a pair of shorts, and a toss on a straw hat and you’re still good to go. 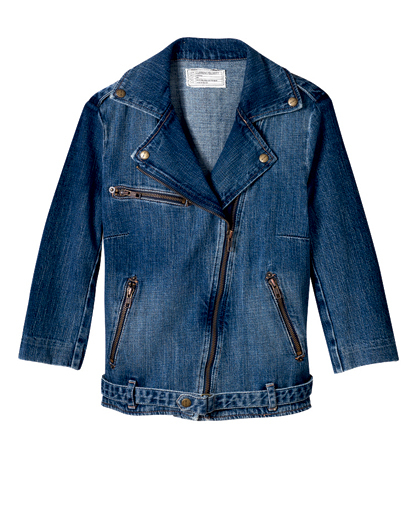 A middle-wash denim jacket — Not too dark, not too light, the classic jean jacket is probably one of the most important things in your closet. Great for those spring mornings and evenings when the temperature is still a little temperamental. These days, designers are doing great things with this essential — asymmetrical zippers, detailed sleeves, strategically-placed hardware, etc. The boxy cut is always in fashion (and means you can thrown a thin sweater on underneath in the fall), but look for something with curved piping at the back to keep the silhouette feminine. Of course remember the classic rule — never match your denim jacket with your jeans. 2. 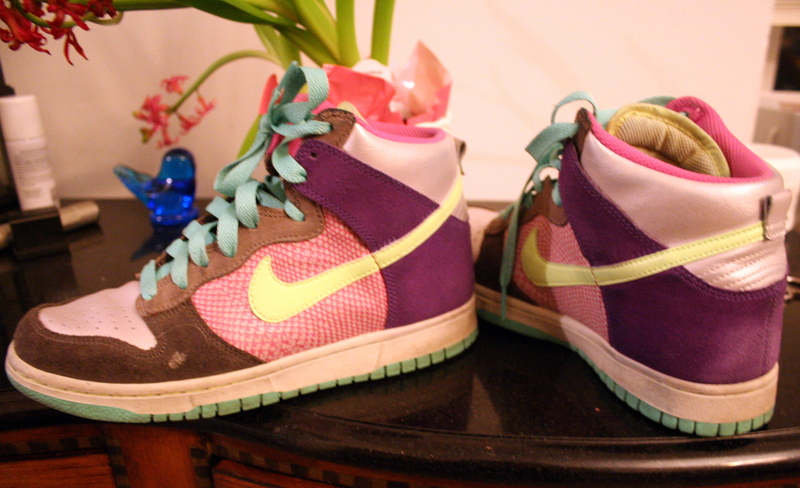 Nike Dunks — the essential weekend shoe in my book, great for taking in the new warm weather on foot. In these, you’ll actually be able to keep up with him and be ready for a pick up game with his buddies. opt for some bright colors, avoid black. A non-black leather jacket — every guy needs at least one leather jacket. And, if you want to stand out from the traditional New York crowd, make your one leather jacket a brown leather jacket (unless, of course, you think of yourself as a young Marlon Brando). A soft, tan-colored motorcycle jacket is young, masculine, and sophisticated. It dresses up the most casual of outfits — your favorite white tee, faded jeans, and sneakers go from sloppy to cool in an instant. It also easily transitions into Fall when matched with a sweater and dark jeans. I vote for suede because it’s lux and tactile — she won’t be able to keep her hands off you. the boot-cut jean –– Time to put away those slim-fit dark jeans, and go back to the classic, more relaxed fit of the boot-cut. Chose middle to light washes or textures that replicate linen. If they fit well and you chose appropriate accompaniments, they’re as smart-looking as those indigo jeans you treat as dress pants. The short-sleeve button-down — Right now, these come mostly in plaid, but a determined shopper can easily find a pinstripe or solid (Banana Republic has some good ones). Something with a military inspiration is universally useful and timelessly chic. If you want to wear a tie, I guess you still can, though might I recommend tucking it in (between the second and third button) to invoke a vintage feel (think 1940s army) rather than a hidden hipster alter ego. 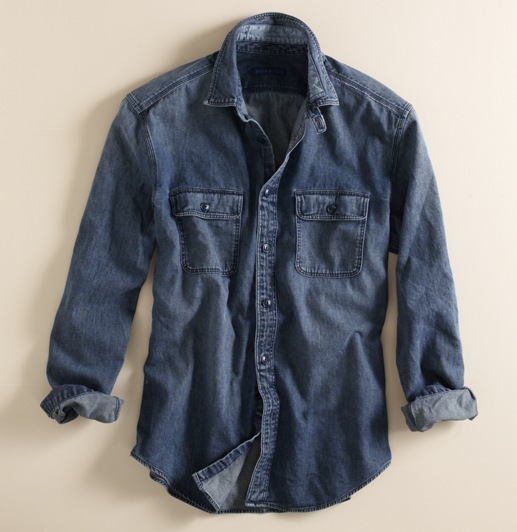 The denim shirt — An American staple. Wear it as a shirt or as a light-weight jacket over a tee. To avoid looking like you just stumbled in off the ranch, don’t tuck it in. Roll the sleeves and throw on some aviators — you can’t go wrong.